$150.00 Out of stock. Email me when new stock arrives. Losander is recognized throughout the world as one of the true Master's at the art of levitation. Losander's Bubble Zombie may be one of the most beautiful and stunning levitation effects you will ever see. Imagine you show a clear tube, dip it in bubble solution, and proceed to blow a large bubble which floats off in front of you. You then display a foulard and the bubble seems to magically dance above the edge of the foulard. 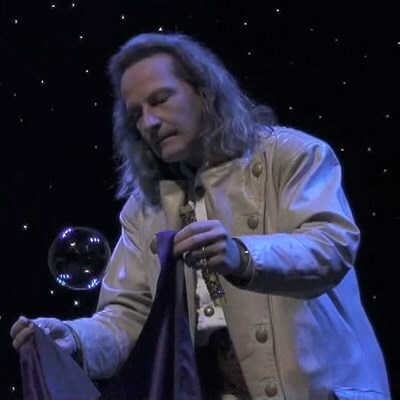 You then proceed to cover the delicate soap bubble with the foulard and it starts to dance and float around with a mind of its own. You then tap the foulard popping the bubble to end what may well be one of the most amazing zombie routines ever seen. Losander has mesmerized audiences with this amazing piece of magic and now YOU will be able to delight your audiences with it as well. Includes everything needed: DVD, Foulard, Bubble Solution and Gimmick. I recently order this from vI and love! I put it in my show and kids and families a like go bananas!